Script located in the non-root-prim-scripts box. The Belt Drive script constantly animates a texture while the engine is running. Texture animation in SL moves the original texture file sideways on the original graphic file, no matter how it is oriented/rotated on the prim. If your belt or chain texture moves sideways, you must save it to local disk, rotate it 90 degrees, then re-upload it. 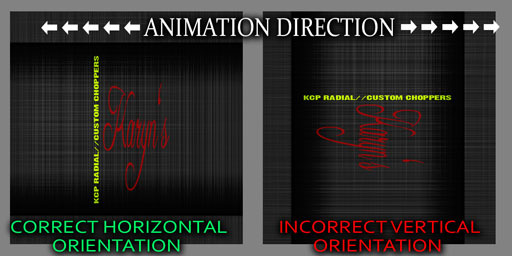 If you do not have the texture file, try asking the original creator to rotate it 90 degrees so that you can animate it with a script. Just think of it as scrolling the original texture sideways (and at 1:1 horizontal/vertical repetitions). This isn't to do with the script, it is just how texture animation works in SL. Any smoothly animating texture, the original graphic file must be oriented to slide left/right, be it belt, chain, tire tread, or anything else. You can rotate it once its on a prim to any angle, but it will still animate in the sideways direction of the original file.